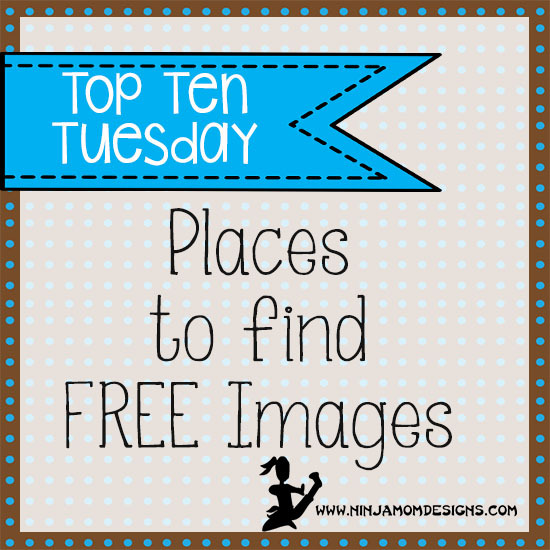 Welcome to Top Ten Tuesday with Ninja Mom Designs!!! Do you make your own stickers? Do you ever wonder where people find their cute images and amazing pictures??? I got into graphic design because I wanted to make fun printables for my blog. I wanted specific images and learned how to make clip art for myself. If you don’t have the time or resources to do that… don’t worry… there are TONS of options for you! Thankfully, there are plenty of sites where you can find FREE images for personal and commercial use. Some people ask for credit (a tag line that says where you got your images) and some people don’t. So just make sure to do your homework! What are your favorite resources for FREE images???? Not sure what to do with Clip Art once you have it??? Check out this post I wrote a while back. These are super great! Thank you. Don’t forget http://www.morguefile.com, as well! Thank you for putting this together and sharing. Also for the hints and tips!